Christmas shines brightest at Busch Gardens® Christmas Town™. The theme park is aglow with eight million lights, one of the largest light displays in North America. Festive food and drink, holiday shopping and heart-warming shows make the season come alive at Busch Gardens. season. Additions this year include Rudolph’s Winter Wonderland, an entire area where guests can meet Rudolph the Red-Nosed Reindeer™ and his friends. The park will also operate a second major roller coaster, Tempesto®, and will open Sesame Street® Forest of Fun™ with a special holiday atmosphere. Visit the big man in red at his North Pole workshop and capture an unforgettable memory. Keep warm with a mug of the park’s signature peppermint fudge hot chocolate and enjoy the spirit of the holiday. (Guests who purchase tickets on the day of their visit at the park will pay the full general admission price of $38. Daily ticket prices and availability can be found at www.christmastown.com/va). For flexibility and the freedom to enjoy Christmas Town multiple days, visitors can purchase the Christmas Town Fun Card, which, for the same price as general admission, allows unlimited visits. The Fun Card is available on the park’s website, or may be purchased the day of visit. Christmas Town is open on select days through Monday, Jan. 2, 2017. For more information on the event and to purchase tickets, visit www.christmastown.com/va (1 Busch Gardens Blvd, Williamsburg, VA 23185, 800-343-7946). With its new family-sized vacation packages (serving 6 -14 people), Atlanta-based Austrian Airlines Vacation Center makes it easy for families and small groups of friends to plan and book a trip to Europe. All the ingredients for a memorable vacation have been combined for travel to four different European cities: Prague, Vienna, Budapest and Barcelona. Each vacation package includes roundtrip air, four nights hotel, daily breakfast, roundtrip transfers between the airport and the hotel, a city sightseeing tour and a farewell dinner. These small group vacation packages that also include all taxes and fees start at $1,449 per person from New York to Prague for travel between January 4 and March 28, 2012. Inclusive pricing from JFK throughout 2012 is already available on www.austrianair-vacations.com, making it possible to start planning now to go to Europe in 2012 to celebrate a high school or college graduation, bar mitzvah, special birthday or anniversary with a small group of family and friends. Pricing from many other cities (such as Washington, DC, Atlanta, Miami, Houston, Chicago, San Francisco, Los Angeles – or your home town) is available upon request. Hotel accommodations are offered in family-friendly, centrally located properties in each city, such as Hotel Beim Theresianum in Vienna, Hotel Elysee in Prague, Hotel Erzsebet in Budapest and Hotel del Mar in Barcelona. The four different vacation packages to Europe are available for travel any day of the week, subject to availability. Weekend surcharges apply. Single supplements, upgrades, additional combinations and extensions are available upon request. 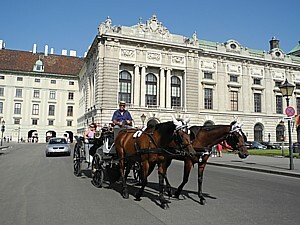 Further details may be found on austrianair-vacations.com. For additional information or to make reservations, contact Austrian Airlines Vacation Center at (800) 790-4682, or info@austrianair-vacations.com. All packages need to be booked at least 14 days in advance. Payment in full is required within 24 hours of confirmation. Once confirmed, the packages are non-refundable, non-transferable, and cannot be changed. Packages will be booked in economy class and are subject to schedule and space availability. Your minimum stay is 3 nights and one Saturday overnight, and your maximum stay in Europe is 30 days. * Package rates are per person, double occupancy from New York (JFK). Package prices only valid for minimum purchase of 6 passengers on same itinerary. Package prices include Fuel Surcharges / US Customs / INS / Aphis Fees / International Transportation Tax / Passenger Facility Charges / Civil Aviation Security Service Fee / domestic and foreign Security and Airport Charges. Prices from other cities may differ. Single occupancy pricing is available on request. Package rates are valid for Monday-Thursday departures. The weekend surcharge is $35.00/one way. All travel must be completed within the above specified date ranges. Austrian Airlines Vacation Center is a division of IMTC (International Marketing & Travel Concepts, Inc.) and specializes in individual vacation packages from the USA to European destinations on Austrian Air. IMTC was founded in 1992 by Bram Majtlis, President, and the privately-held company is headquartered in Atlanta, Georgia. Other IMTC divisions include: IMTC/Pegasus, IMTC Concerts, Gold Concepts Public Relations and EdiTour. Brendan Vacations’ Escorted Family Vacations allow you to take a break and enjoy some quality time with your kids at a great value and price and with a wide array of destinations, including the USA, Europe and Ireland. And, when you book a qualifying 2011 Escorted Family Vacation before August 31, 2011, you will receive a $200 American Express gift card (more details on http://www.brendanvacations.com/familytravel/). These enriching experiences have been carefully planned to include fun, multi-generational and kid-friendly activities that will entertain and educate children of all ages. You might find yourself decorating your own colorful Carnival mask in Venice, making paella in Valencia, riding on the London Eye, visiting a dude ranch in Wyoming, enjoying a poolside pizza party, or playing an exciting round of miniature golf. “Trails of Liberty” – 8 Days. Experience the heart of America like never before on this exploration into the history of the United States of America….Priced from $1,650 land only, based on double occupancy. “Castles, Lighthouses & Pots of Gold” – 8 Days. Experience the majesty of Ireland on an 8-day Small Boutique Escorted Vacation, providing small group discoveries of Dublin, historic lighthouses and other sights all while on a luxury motorcoach with no more than 24 passengers…. Prices starting from $1850 land only, based on double occupancy. “Castles and Kilts” – 10 Days. In London, join a city tour and see the Houses of Parliament, Big Ben and Westminster Abbey. On to see the location of the red telephone box where Harry and Mr. Weasley descended into the secret Ministry of Magic from the Order of the Phoenix, plus the magical platform 9 3/4 sign where Harry caught the Hogwarts Express… Priced from $2350 land only, based on double occupancy. To book, call 800 421 8446 or www.brendanvacations.com/familytravel for complete tour descriptions and a full listing of eligible itineraries.